recover and improve the rankings of more than 36.000 sites. 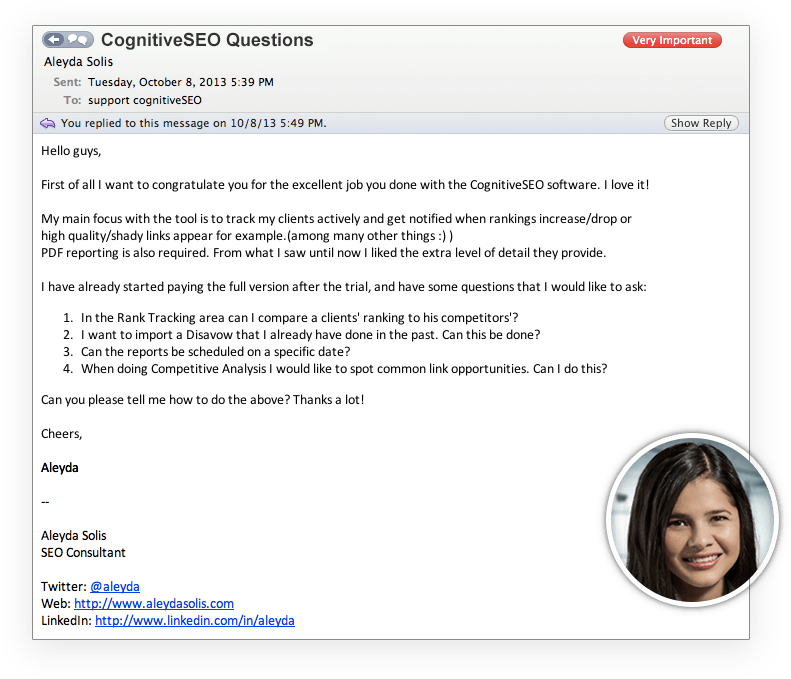 How Will cognitiveSEO Help You? Whether you are an SEO Professional, Digital Marketing Agency, SMB or Brand, looking to increase your traffic or to monitor your site's evolution, this SEO software will provide you with best in class digital marketing strategy analysis and insights for your business. The cognitiveSEO toolset is a complete digital marketing solution and most likely, the only SEO tool you'll ever need. The tool flags all possible SEO issues and provides recommendations on how to fix them so that you can experience increased rankings and traffic in a matter of days. With the ever-evolving search engines algorithms you need an efficient solution to keep your rankings safe. 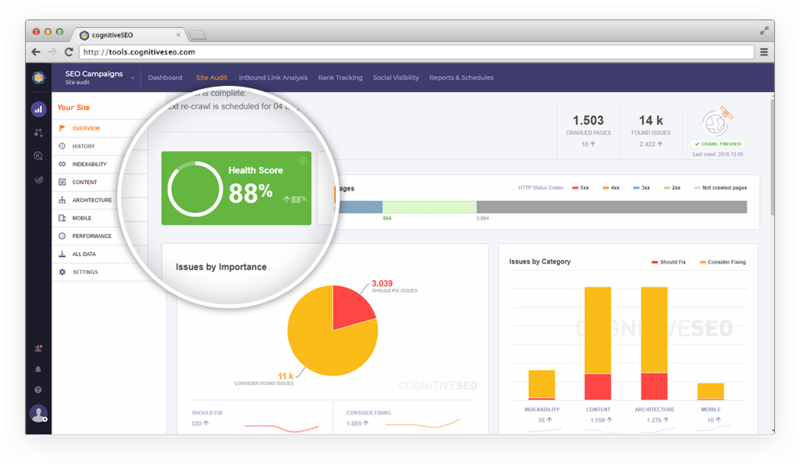 cognitiveSEO's Site Audit tool helps you detect all the weak points of your website before your users do and lets you know exactly what’s holding your website back from ranking. 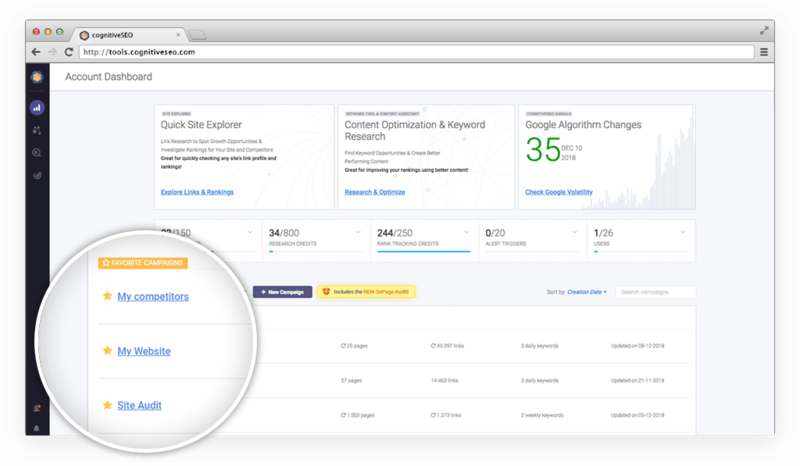 Our SEO Audit Tool crawls all the pages it finds on your website to provide a fully customized set of data easy to comprehend and visualize. It also offers powerful recommendations on how to fix the error on your site so you can outrank your competitors and quickly increase your overall website performance. 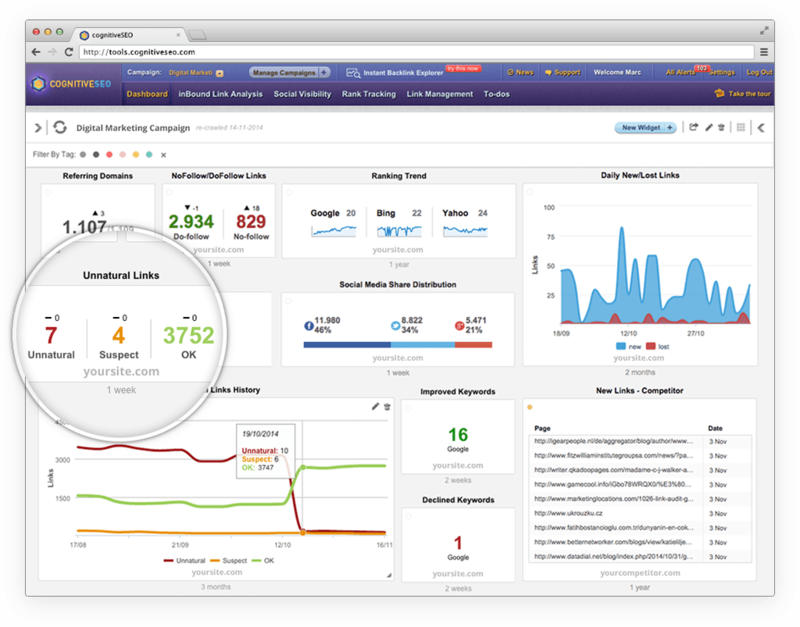 Be one step ahead by actively analyzing and tracking your site and your competitors. The SEO tools provide a unique analysis process that will extract critical data for your internet marketing campaigns. We deliver and prioritize marketing intelligence datapoints in a way that will make it easier for you to understand why your site may not be ranking as it should be, while your competitors are reaping all the search benefits. Making use of advanced Google semantic search algorithms, we bridge the gap between old school SEO and the new content marketing. 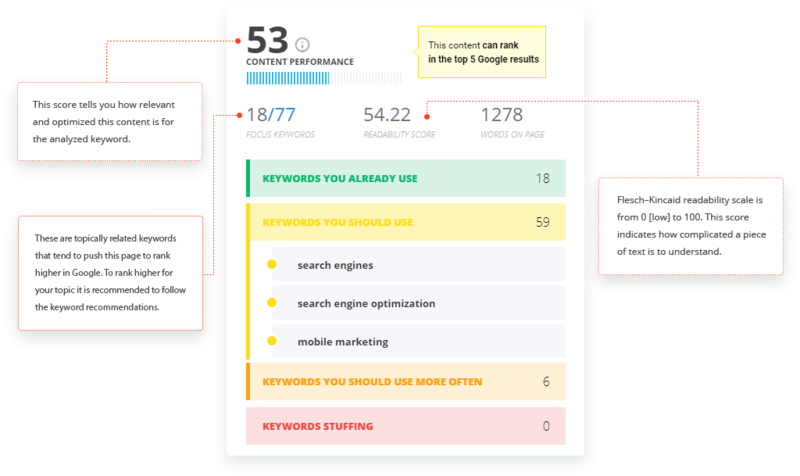 Our competitive research tool is a full stack marketer that will help you get top rankings in 3 easy steps: Keyword Research, Ranking Analysis and Content Optimisation. We can tell you how optimized and relevant for search results any piece of content is, for a set of targeted keywords. By introducing the Content Performance Score, you will see the exact impact that content has on rankings. At the moment, the Keyword Tool is the fastest way to boost your Google rankings and increase your organic traffic in a matter of hours. Whether you were affected by a manual or algorithmic link penalty caused by the Google Penguin Update, you can use the unnatural link detection tool to identify the problematic links that led to the penalty. The tool scans your entire link profile and detects the unnatural links that might have caused the penalty. After the detection process is complete, you can either create an outreach list and contact the site owners in question or you can generate a ready-to-send Disavow File. The cognitiveSEO Rank Tracker offers accurate country, language and city precision for all your tracked keywords. Understanding the power of contextualized search engines rankings, our ranking checker integrates desktop and mobile keyword research, giving you a detailed perspective of your ranking data and keyword position. 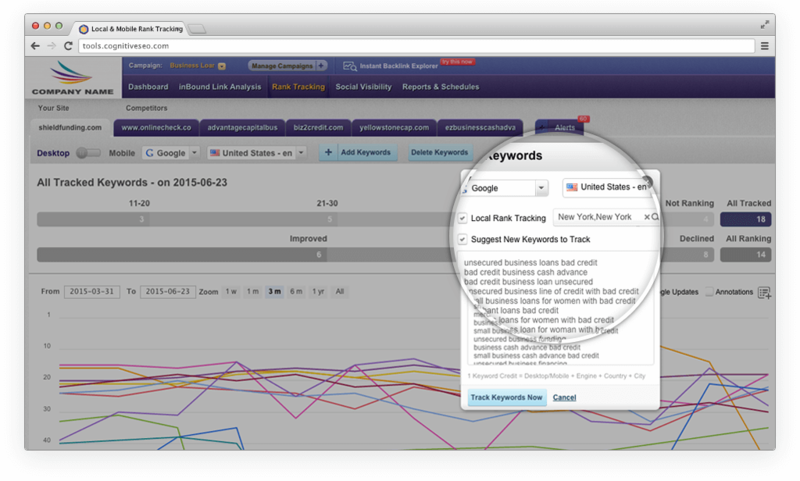 As the same tracked keyword can have different SERP positions on local or mobile rank tracking, our rank monitor tool helps you always be in touch with your real keyword rankings for any location. Identifying and understanding the exact digital marketing strategies your competitors are using is key to your ongoing success as an online business. Knowing how their link building strategy was implemented over time or what content marketing strategy they ran will reduce the chances of getting caught off-guard by your opponent's tactics. 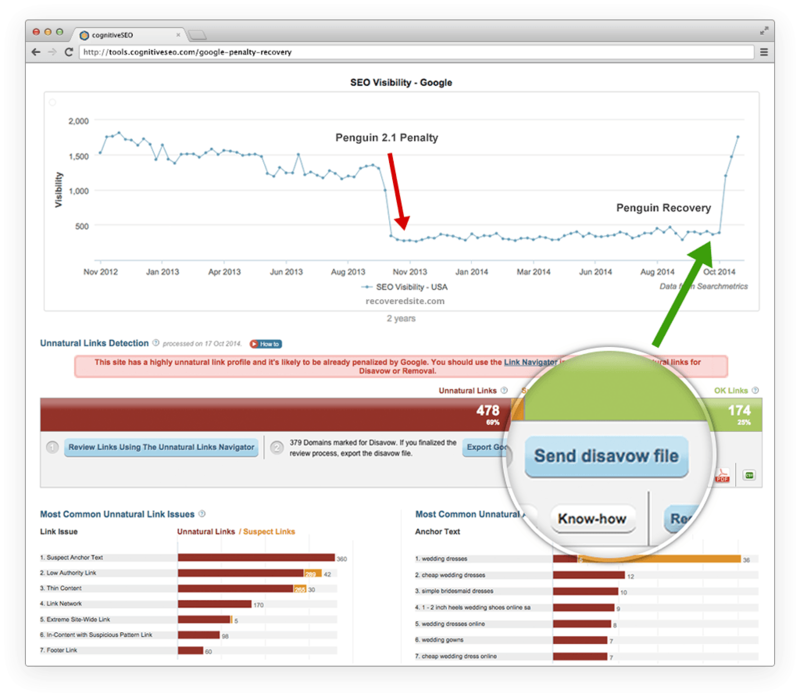 How Do Other People Use cognitiveSEO? Aleyda Solis, an international SEO Consultant & Speaker, uses cognitiveSEO to manage her digital marketing clients and pitch to new ones. She uses the backlink analysis, rank tracking and social visibility tools to research, track and report to her clients. The digital marketing tools are used best by SEO Professionals, Agencies, Brands and SMBs. To get the best out of the SEO tool you should have at least a medium understanding of SEO and Internet Marketing. The complete documentation and tailored customer care provides an even better experience while using the tool. Rest assured, you are in good company! We at cognitiveSEO are not only a bunch of software developers but passionate experts in our niche. We frequently write in-depth analyses on the way SEO and digital marketing is used to increase the traffic to various websites. Keeping an eye on Google's algorithm updates is very important from our point of view, and that is why we provide detailed assessments about how the search engine evolves.